Discussion in 'B4R Tutorials' started by Erel, Jul 7, 2016. B4R v1.20 added support for ESP8266 modules. ESP8266 is a great module for IoT solutions. For a few dollars you get a powerful microcontroller with built-in support for wifi. I recommend to develop with a board that includes a USB to serial converter. In Arduino IDE -> Tools - Board - Boards Manager. Search for esp and install esp8266 by ESP8266 community. Install v2.4.2. ESP8266WiFi - Responsible for connecting or creating the wireless network. WiFiSocket - Equivalent to EthernetSocket. WiFiServerSocket - Equivalent to EthernetServerSocket. ESP8266 - Currently includes a single method that restarts the board. D1Pins - Maps the pins of WeMos boards. Working with ESP8266WiFi is simple and similar to working with the Ethernet shield. Example of a socket connection (depends on rESP8266WiFi and rRandomAccessFile). If wifi.Connect("dlink") Then 'change to your network SSID (use Connect2 if a password is required). Make sure to update the ESP8266 ip address, it will be printed in the logs. - Under the hood there are many differences between ESP8266 and the Arduinos. One of the differences which can be relevant for developers is that the network stream is buffered. If you are writing directly to WiFiClient.Stream then you will need to call WiFiClient.Stream.Flush or the data will not be sent. This is not required when writing with AsyncStreams (which is the recommended way). - Check the board voltage. The WeMos board is 3.3v. - Not all libraries are supported. DonManfred, Peter Simpson, pesquera and 7 others like this. It will probably work as it is based on ESP8266. how read and send byte array ? Thank you, it works great, made a little UDP server. In Station and Access Point mode. However, after a wifi.StartAccessPoint2(...) the AP mode cannot be switched off anymore. Only, via the Arduino IDE by setting a WiFi.mode(WIFI_STA) which terminates the mode WIFI_AP or WIFI_AP_STA. Please start a new thread for this in the questions forum. It is simple to call those methods with inline C.
@Bert Oudshoorn please start a new thread for this question and make sure to use code tags. how can I install this driver ? How Can I write program directly to esp8266? 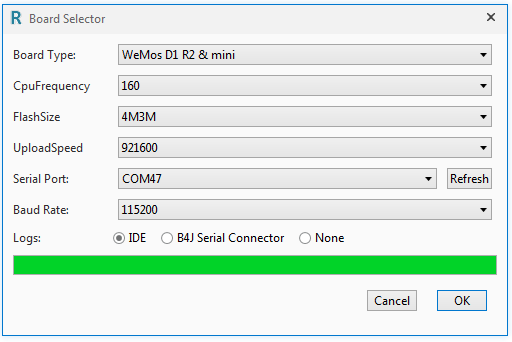 without wemos D1 ? is there any code to use? There is no code to get into programming mode. You have to attach one pushbutton between GND- Reset and a second one between GND-GPI00. while keeping GPI00 down until programming is finished!! Did you include buttons? See what Positrom2 wrote: Hold down GPI00 button, press and release the reset button and then start programming. Include a resistor of 220 ohm between the led and earth. can you draw the schematic?